SILENT MAJORITY. United Russia is not a party to get excited about. It’s made up of apparatchiks who like power and all that it brings. No one who votes for it is proud of doing so. Its program is boring: support the Boss and more of the same. But more of the same isn’t so bad for millions of Russians who endured the lawlessness, disorder and poverty of the 1990s. Their lives are better by every measurement: more employment, better wages, longer life span, more freedom in the useable sense, higher pensions, improved medical care, more and better infrastructure, more opportunities. So millions of Russian voted for more of the same. Putin is the symbol – and for very good reason – of the measurable and real improvements in the situation of Russians. So they vote – unenthusiastically perhaps, not boasting about it, maybe even with a sense of embarrassment in front of their voluble and hip children – for more of the same. In short, not the kind of people who go out to demonstrate. 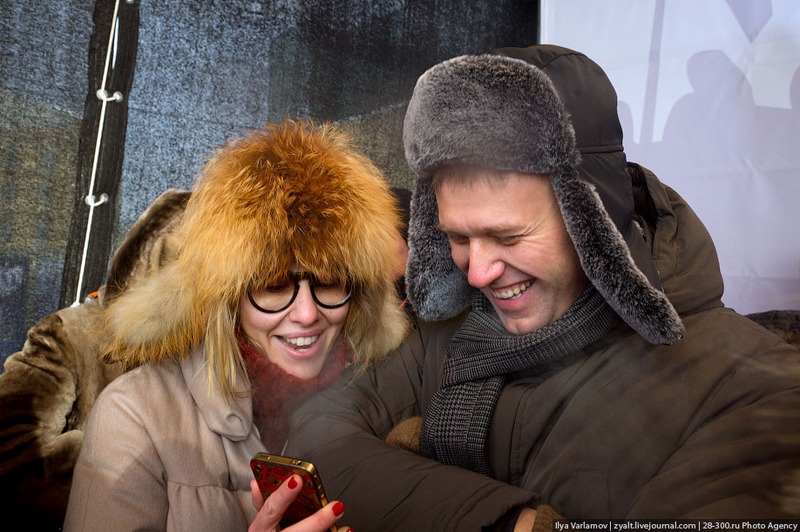 The anti-Putinists are exciting – young, hip, vibrant, trendy – and they want more. They go out on demonstrations with their Iphones and the Western media fawns over them and they believe they are “making a difference”. And they are. 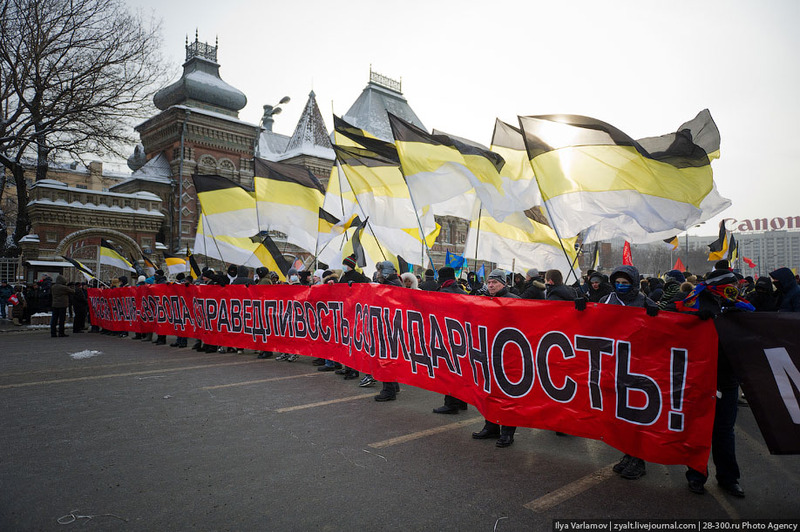 If we remove from the recent anti-Putin demos the former ins who are out and want back in, the Communists and the super-nationalists, the remainder do represent something. That something is inchoate as yet; but it will have its moment eventually. But the silent majority struck back on Saturday. What had been planned as a rather modest pro-Putin demo – after all they got a permit for only 15,000 people – turned out to be one of the largest demos in Moscow’s history, easily dwarfing the anti-Putin protest. (See my counter to the Associated Press’s absurd/mendacious number of “no more than 20,000 people” – re-typed by hundreds of media outlets around the world.) 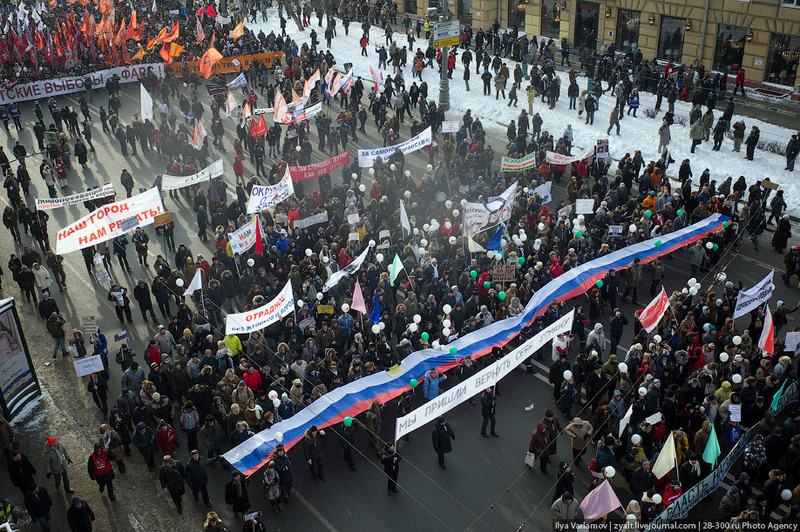 The pro-Putin, or, as it was styled, “anti-orange”, demo pulled at least 100,000 people. There were many demonstrations that day around Russia and Kommersant (not a particularly Putin-friendly organ) produced a map that shows the pro-Putin demos pulled more people than the antis. The themes of these pro-Putin demos (perhaps anti-Orange is the more accurate term) were “if not Putin, then who?” and “no Orange revolution in Russia”. Putin himself expressed surprise at the numbers – and, remember, it was only supposed to be a 15K demo. Russia’s silent majority has spoken. What has it spoken against? The arrogance of the antis, their Western connections (in this respect the new US Ambassador’s meeting with the opposition was a gift), the lack of any program other than “anybody but Putin” (Anybody? Zyuganov and Zhirinovskiy are the perennial runners-up; do these people really think they’d be better off under either of them?). If anything, all this has strengthened Putin’s re-election chances. The “silent majority” is aroused and angry. As to those who say that the pro-Putin rallies are manufactured and therefore don’t count, where do they think the opposition gets its banners, balloons and flags? It takes a lot of organisation (and money and buses) to get tens of thousands out on the street and all lined up: demos of those magnitudes are not “spontaneous”. STAGNANT. Russian politics are very stagnant. Putin 2.0 will be opposed, just as Yeltsin, Putin 1.0 and Medvedev were, by the ever-stale Zyuganov and Zhirinovskiy. A cynic would assign the following mottoes to the pre-eminent political forces. United Russia – We like power and always agree with the Boss. Just Russia – United Russia with a smile. Communists and Zhirinovskiy – We oppose the Establishment in public but privately do well out of it. The evanescent “liberal” parties – I am the Repository on Earth of all that is True and Good and the rest of you should bow your head to me. Not much of a choice, but at least United Russia has a record – Putin and Medvedev’s record – to stand on. But it does now seem as if the swamp is beginning to drain with the appearance on the scene of the minority “new young people” and the “silent majority”. It is an undeniable fact that both could be called “Putin’s children”. The first because of the opportunities that have appeared since his arrival and the second because of all the boring – but vital – improvements in ordinary life. Saturday’s demos show that the anti-Putinists have probably peaked and the majority has shown its teeth. PUTIN ON DEMOCRACY. You can read the original or what The Guardian thinks you should know: it doesn’t think you should know Putin quotes Solzhenitsyn. That would spoil the meme. SYRIA. Russia and China vetoed the UNSC draft resolution and the Russian Foreign Minister explains why. (China’s POV.) For many years Moscow has dreamed that it can use its influence to settle some large international issue. It hasn’t succeeded yet but is trying again in Syria. Who Ya Gonna Believe? The Associated Press or Your Lyin’ Eyes?